I've talked many times about the Cauldron in many different contexts. There is so much Mystery in it. Image from Myths and Legends. 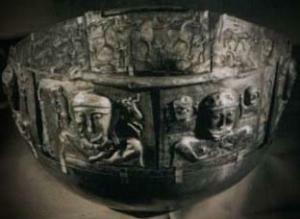 The Cauldron of the Welsh, Britons, and Irish became the Graal when Christianity came, and later became a cup. Sometimes the Cauldron appears as a well, sometimes the Graal, sometimes a Cup, sometimes a pentagram. It is Water and it is Earth. It is the Sea and it is the Land. It appears in many cultures, many religions, many myths, in many forms. As I've discussed before, based on Cochrane's letters, the Cauldron is Movement, this world, Fate. The Movement inside is there to point us to the Stillness outside. The Graal, the Cauldron, is Fate and the overcoming of Fate. Fate is there to overcome and become what we need to become, not to be the bonds that hold us, as it is for most people. Here, we have the Cauldron hanging from a chain from the roof, suspended over the fire. In the Celtic myths, the Cauldron was always sitting in the flames. I think this difference is significant. It makes me think of Odin hanging on the tree for nine days, and of the sacrifices to him and Twr hanging on trees. Suspended above instead of sitting in the fire, is a little cooler. Meat heated slower becomes more tender. The Celtic Cauldron had water, soup, stew, liquid based mixtures. The goal is to boil the water and hence cook what's in it. In the Viking Cauldron, it isn't water but meat. You aren't boiling, you are simmering. When you boil, you have the Roaring Cauldron, violently moving. When you simmer, you have the Seething Cauldron. But both are Movement. If the Cauldron is Water and Earth, the flames are Fire. Suspended, the Cauldron is in Air. In the Seething Cauldron, we have primarily meat. This is a sacrifice, not a normal meal. The meat represents life. The animal is killed, it's life taken, life becomes death. The dead animal goes in the Cauldron. The whole process is the sacrifice. First the killing, the taking of the life, giving the life to the god. Then the seething, the simmering, preparing the meat, creating a meal for the god. The Seething Cauldron prepares the meat for the god. Just as this world, and Fate, prepares us, simmers us until we're ready for the gods. Bran's Cauldron also has dead meat put in it. If you put dead humans in it, they came back alive, though they couldn't talk. The Cauldron broke when Bran pretended to be dead and was put into it alive. Life comes from the Cauldron, but only if death goes in. The sacrifice must be killed before it goes in the Cauldron. As I said, the Cauldron is used to prepare the meat, change it from the dead animal that was sacrificed and into a meal for the gods. The tenderness is key. It is the reason for the seething, for the simmering. Why tender? Well, who wants to eat tough, chew meat? People want meat to melt in their mouth, not chew it for three years. But there's symbolism here as well. Tenderness is about being soft. Going back to the idea of this world and Fate, the Cauldron, preparing us to be ready for the gods, this world makes us "tender" for the gods. If we're "tough and chewy", we won't listen. If we don't listen, we can't change. What's tender is flexible. We need flexibility to change. 2Speak unto the children of Israel, and say unto them, If any man of you bring an offering unto the LORD, ye shall bring your offering of the cattle, even of the herd, and of the flock. 3If his offering be a burnt sacrifice of the herd, let him offer a male without blemish: he shall offer it of his own voluntary will at the door of the tabernacle of the congregation before the LORD. 4And he shall put his hand upon the head of the burnt offering; and it shall be accepted for him to make atonement for him. 5And he shall kill the bullock before the LORD: and the priests, Aaron's sons, shall bring the blood, and sprinkle the blood round about upon the altar that is by the door of the tabernacle of the congregation. 6And he shall flay the burnt offering, and cut it into his pieces. 9But his inwards and his legs shall he wash in water: and the priest shall burn all on the altar, to be a burnt sacrifice, an offering made by fire, of a sweet savour unto the LORD. 10And if his offering be of the flocks, namely, of the sheep, or of the goats, for a burnt sacrifice; he shall bring it a male without blemish. 11And he shall kill it on the side of the altar northward before the LORD: and the priests, Aaron's sons, shall sprinkle his blood round about upon the altar. 13But he shall wash the inwards and the legs with water: and the priest shall bring it all, and burn it upon the altar: it is a burnt sacrifice, an offering made by fire, of a sweet savour unto the LORD. 14And if the burnt sacrifice for his offering to the LORD be of fowls, then he shall bring his offering of turtledoves, or of young pigeons. 17And he shall cleave it with the wings thereof, but shall not divide it asunder: and the priest shall burn it upon the altar, upon the wood that is upon the fire: it is a burnt sacrifice, an offering made by fire, of a sweet savour unto the LORD. This sweet savour from the burnt offering is what we find with the Viking sacrifice with the smell, the aroma, rising off the seething meat. I suspect the symbolism is similar. The aroma rising off the meat is the worship of the people, their prayers, their praise, rising up from Midgard to Asgard. Are the participants in the sacrifice called Seething because they are companions to the Seething Cauldron, to the sacrifice, or because they move like the contents? Fries seems to think the later. I get the image of the participants in the temple dancing, moving, as Fries says, shaking, around the Cauldron, like the images of Africans dancing around a fire, or like the images of Native Americans doing the same, or like Mummers, dancing in Britain. They are moving like the contents of the Cauldron are moving. They are companions to the contents, but they are one with the contents, moving like the contents, becoming the contents. The contents and they are one. There isn't a separation between the sacrificer and the sacrifice. They are one. We are the animal, the sacrifice. We are the temple, the chain, the Cauldron, the fire. We are the meat in the Cauldron, and the aroma rising from the meat. All is one. A meal for the god, for the gods. Ritual connects us to the gods. It always includes sacrifice, but not always in a tangible way. Sacrifice is life, death, and rebirth, the Cauldron. And ritual unites us with that, and through that with the gods. Like with the Viking sacrifice we've been discussing, the ritual isn't something that we do, something separate from us. The ritual is us and we are the ritual. We are the sacrifice, what is given to the gods or spirits. Without the connection between us and the sacrifice, the sacrifice has no meaning. What is consumed becomes one with the consumer. We are what we eat. The sacrifice of the Vikings is a meal for the gods. It becomes one with the gods. The sacrificers and the sacrifice are one. When the gods consume the sacrifice, the gods and the sacrifice become one, so the gods and the sacrificer become one. This is what ritual is all about.